The historical Buddha, Shakyamuni, is thought to have lived in the 6th or 5th century BCE. After a long illness, he decided his earthly life would end at Kushinagara in India. On arrival there the Buddha lay on his right side on a stretcher between two trees. He faced west with his head towards the north. On the night of his 80th birthday, under a full moon, the Buddha entered parinirvana, a final state for those who have achieved enlightenment. The composition of this painting follows images of this great event that date back to the early 1200s. 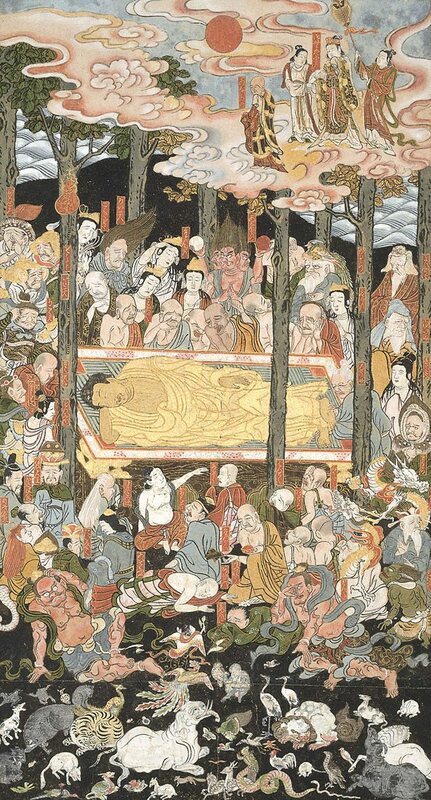 The Buddha is shown surrounded by grieving animals, monks, lay-people, enlightened beings and deities. In the clouds above, the Buddha’s weeping mother Maya arrives with her entourage.